Osaka is a food town. Any place that coins a term for eating until you collapse — kuidaore — has to be, to some degree, obsessed with food: making it, eating it. And thanks to this well-deserved reputation for deliciousness, Osaka has been pulling in more and more hungry visitors. 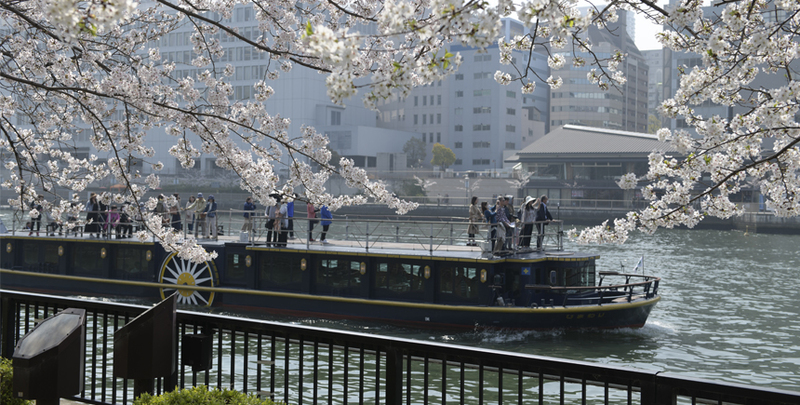 Last year, a record 11.11 million foreign tourists came to get a taste, according to the Osaka Convention and Tourism Bureau. Most of these visitors make a beeline for Dotonbori, the neon-spangled street with a head-spinning selection of Kansai specialties, from takoyaki octopus balls to the steamy tofu and noodle marriage called kitsune udon. But where do you go for more variety, and something a bit more local, a bit more off-the-beaten-track? Tie on a bib and dig in. Sandwiched between Namba and Tennoji Stations is a nostalgic cluster of alleys dating from before the war. Called Shinsekai, or the “New World”, it was developed following the 1903 National Industrial Exposition as a futuristic entertainment center. Luna Park in the southern half was an homage to the amusement park of the same name in New York’s Coney Island, while the northern half was modeled on Paris, complete with a landmark tower called Tsutenkaku. Since that turn-of-the-century burst of development, Shinsekai has been left much as it was, which means today it oozes gritty, retro-futuristic charm, especially after dark when raucous music and bright lights spill out from the area’s restaurants and bars. It is particularly well known for fugu (blowfish) and kushikatsu, battered and deep-fried skewers of pretty much anything that can be skewered, from strips of meat to ice cream. Zuboraya is famous for delectable variations on fugu that use every edible part of the fish. Order tessa for a huge plate of thinly sliced fugu sashimi laid out like chrysanthemum petals. Tecchiri is a warming fugu hotpot packed with fillet meat and vegetables. And for the extra adventurous, shirako is a soft roe with rich flavor you can eat raw, grilled, fried or boiled. Next, follow the lines of people waiting and you’ll end up at the original location of Daruma Kushikatsu, easily recognizable by the chef mascot glowering cartoonishly at the entrance. This shop opened in 1929, when the proprietor is said to have invented kushikatsu as quick, filling food for local laborers. It’s loud, raucous and welcoming as long as you remember the one unbreakable rule: no double-dipping in the sauce pots! Start with the variety set, featuring classics like lotus root and pork cutlet, then branch out to Kansai specialty benishoga (ginger pickled in plum vinegar). One last pit stop in Shinsekai is Aji-no Daimaru, a not-to-be-missed shop for an endless supply of Osaka’s famous takoyaki, balls of wheat flour batter and octopus served with a savory brown sauce and mayonnaise. Not only are they delicious and all-you-can-eat, but you also make them yourself at the table, mastering the art of turning the gooey dough with metal skewers as you go. Another underground gem is the area around Temma Station, where working-class apartment buildings and a wealth of mom-and-pop eateries cluster around Temma Market. Its history stretches all the way back to the mid-17th century, when a wealthy merchant in nearby Kita Ward opened a vegetable market on the grounds of his residence. The market grew to the point that people were calling it the Kitchen of Japan for the sheer volume of produce that passed through. Development and disasters forced the market to relocate many times, but after World War II, it settled in its current location, bringing with it restaurants wanting to be as close to the wholesale action as possible, particularly seafood purveyors who live and die by freshness. A few decades ago, the market opened a retail side as well, attracting a whole new crowd. 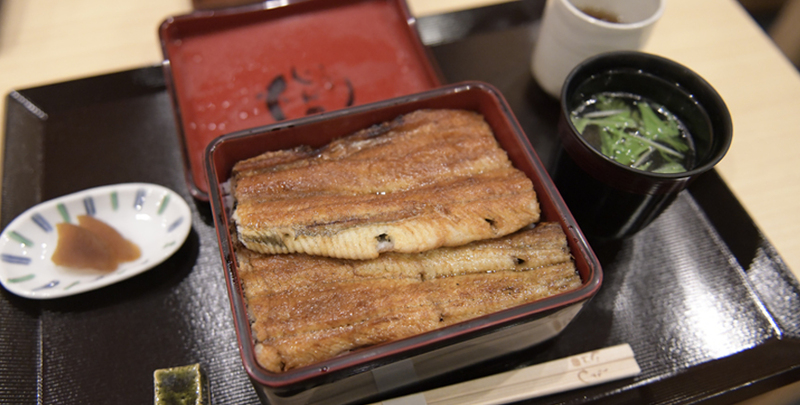 “Four years ago, things started to get really buzzy around here in Temma Market,” says Kuniharu Jinta, proprietor of Unagi Jinta, an unagi (eel) specialist restaurant and one of the market’s main draws. “More bars have opened up so it’s also become a night hotspot. It’s one of those booming neighborhoods where everything is now cool, but still more of a local open secret, although more and more tourists have been coming to visit.” Tucking into their butter-soft eel — glistening in their signature sauce, on a bed of steaming hot gohan (rice) in a special lacquer bento box — is an event in itself, and knowing the intriguing history behind this establishment makes for an added treat. If you’re feeling ravenous, an essential stop would be Yakiniku Bancho. It may not look like much with its oil-drum tables and plywood paneling, but the meat here is outstanding. As the name suggests, yakiniku barbecue is the main attraction. Grill cuts of beef, pork and chicken at the charcoal grill built into your table and then dip them in the sweet-spicy house tare sauce. Upstairs, they have a similar restaurant dedicated to seafood called Osakana Bancho, where you can choose your dinner from tanks of crab, shrimp and schools of fish pulled fresh from the Pacific. However, if oysters are your pleasure, opt for Kakigoya Fever 1111 around the corner, where they offer 90 minutes of all-you-can-eat grilled oysters. Of course, you can also have them iced on the half shell, deep fried or in gyoza dumplings. They always have a selection of different Japanese varieties to compare and contrast. Meanwhile, oenophiles congregate at Luv Wine, where the extensive European wine list and cute corner location make it an excellent spot for an evening of people-watching or romantic canoodling. Commuters alighting at the Fukushima Station are greeted by bright murals of the Seven Lucky Gods; deities from Buddhism, Shintoism, and Taoism said to grant prosperity and health. They are a rotund bunch, no doubt having enjoyed the bountiful culinary options available. The opening of Hotel Hanshin in 1999 was a gentrifying force on this somewhat neglected neighborhood — upmarket eateries and boutiques have moved in to court hotel guests and savvy young Osakans avoiding the crowds in nearby Umeda. For now, Fukushima straddles the two worlds: home to Michelin-rated fine dining, but also scores of atmospheric hole-in-the-wall eateries, Japanese-style pubs and standing bars from the area’s shabbier days. The unmissable Hanakujira should be your first stop, where Zegna-clad salarymen from Umeda convivially rub shoulders with local grannies and pierced punks to get a bite of the soupy soul food oden. Grab a counter seat to watch the tong-wielding chef pluck delicious bits of fish, vegetables and other less familiar items from the steaming vats of umami-packed broth. Try staples like daikon (white radish), konnyaku (yam cake) and boiled eggs, or just point to whatever takes your fancy, eating it with a bit of yellow karashi mustard and a slurp of broth from your bowl. Since then, he’s been stone-milling pure soba flour on site and hand-rolling noodles, slicing them in a thin style called hosokiri. “That way you really get the flavor of soba,” he says. Settle in with a drink and a handful of appetizers sure to please traditionalists, like saiboshi smoked horse and dashimaki egg rolls. Then, choose from a variety of soba dishes, both hot and cold, and polish off the meal with a draught of hot soba-yu water added to your dipping sauce. From there, head over to izakaya Tottsuan for the Osaka-style gastropub experience, Gyutan Bekokushi for their specialty cow tongue or Banda for the best paella this side of the Pyrenees. Finally, head over to Nakazakicho, just a stone’s throw from bustling Umeda. This retro-chic residential neighborhood has surviving buildings from before the war; mostly squat and cheery two-story wooden homes, with clay-tiled terraces and sliding doors, squished wall-to-wall with their neighbors into winding greenery-strewn lanes. Due to an aging population, the neighborhood had been suffering from a blight of vacant properties in disrepair, but in 2001, butoh dancer (modern dancers who dance covered in white paint) and artist Jun Amanto set up a community space and café called Salon de AManto. It evolved into the artist collective Art Eco Village, which has attracted more than 100 shops, restaurants, and galleries to the neighborhood. Working with property owners, the collective renovates empty buildings into commercial spaces for businesses focusing on sustainability, community and fair trade. One beneficiary of Art Eco Village is La Granda Familio, purveyors of organic, fair-trade granola with no artificial sweeteners or refined sugar. Inspired by food insecurity after the March 2011 Tohoku earthquake, they also developed a high-calorie bar based on okoshi (puffed rice) snacks. Despite this recent renaissance, Nakazakicho is still relatively undiscovered by tourists. Local Miyuki Naka, an insurance company manager, comes often to enjoy the cafés and bars. “Nakazakicho is next to Umeda, but still not that many people come here. Maybe because it’s a residential area, it feels a bit intimidating to outsiders. But it’s really an enjoyable place,” she says. Let the area’s painfully cute cafés lure you in — it’s almost impossible to wander far without being charmed into a sunny nook of some quaint shop selling handcrafted denim or one-of-a-kind leather accessories. Two standouts are Taiyou no Tou, a teeny café that opens early with traditional Kansai breakfast sets — a light set meal like toast, an egg and a cup of coffee for a few hundred yen — and serves delicious cake all day, and Pipinera Kitchen, a café dominated by a kitschy-cool collection of old-fashioned toys and a bossy black cat called Shijimi-chan. There’s so much to explore beyond Dotonbori, and perhaps the challenge is to manage kuidaore. Whatever you do, don’t forget to say thanks for the feast in the local dialect: gossosan! Akihime, Benihoppe, Nyoho, Sagahonoka, Tochiotome: comparing and contrasting all of Japan’s famous strawberry varieties is a foodie’s dream day. The season wraps up this month in Kansai, but there’s still time to stuff yourself silly with that sweet, sweet berry goodness at Osaka’s all-you-can-eat picking farms. Generally, you pay a flat fee for a set amount of time and then pick and eat all the strawberries you want. Often, you’ll also get a container of sweetened condensed milk to dip them in. Demand is high as it’s a popular family activity, so advance reservations are recommended. Osaka no Aji Takoyaki Sauce. The brand literally means “the taste of Osaka”, and from this third-generation Osakan sauce maker, you can believe this takoyaki topper lives up to the hype. Available at supermarkets and souvenir shops. Jiyuken Curry Sauce. This versatile condiment comes from the famous Jiyuken curry shops. Head to the original location in Naniwa, try their classic curry rice and raw egg and then pick up a bottle of the original sauce to take home. It adds a kick to rice and fried food and even makes a nice sauté sauce. Asahi Ponzu. Made in Osaka, this popular ponzu draws on the best produce from around the archipelago. Hokkaido konbu (kelp), Kyushu katsuobushi (fermented and smoked skipjack tuna), Oita shiitake mushrooms and Tokushima sudachi citrus are blended into a smooth, tart vinegar sauce perfect for hot pots and dressings. Available at any supermarket.